Bio Creative Labs announces their new limited edition Essential Oil Serum-Infused Facial Sheet Mask collection. The masks feature a cotton-based sheet infused with lightweight serums formulated to treat common skin concerns including dehydration, clogged pores, dull complexion, and excess sebum. 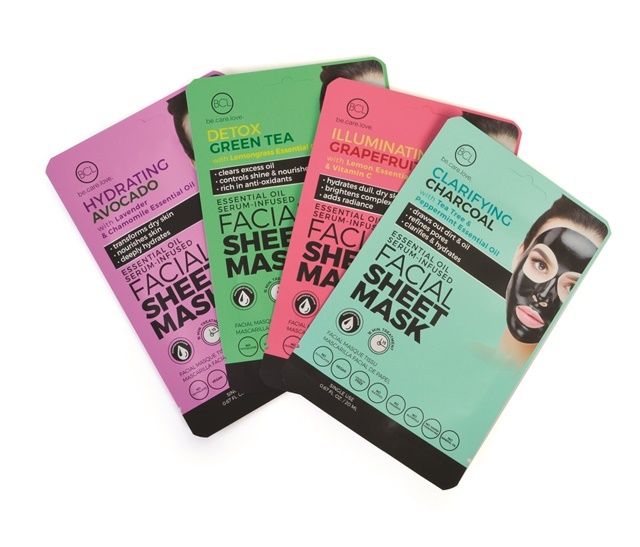 The collection includes: a Hydrating Avocado Facial Sheet Mask with lavender and chamomile essential oilse, a Clarifying Charcoal Facial Sheet Mask with tea tree and peppermint essential oils, an Illuminating Grapefruit Facial Sheet Mask with lemon essential oil and vitamin c, and a Detox Facial Sheet Mask with lemongrass essential oil. The masks are cruelty free, vegan, and free of phthalates, sulfates, parabens, alcohol, harsh preservatives, and mineral oil. For more information, visit BCL Spa.